Relentless in bringing the fashion furious men of the UK the best in urban apparel, 11 Degrees hunts down those goods that are sure to keep you on trend, all-year round. For every occasion on the books, a chill at the pub, date night and of course, a heavy gym session - kit yourself out in 11 Degrees clothing and accessories to always look and feel at the top of your game. You only need to visit the different collections online to get inspired for your looks. From Performance gear, to the Holiday Shop, Going Out goods and more - your options are endless here. Taking the fashion scene by storm in 2014, 11 Degrees prides itself on offering an ever-expanding catalogue of suave clothing. Here you can shop jackets to stay high and dry while looking fresh. With bombers, windbreakers and more in classic and bold colours to suit your personal style - you’ll be sure to always step out in confidence with these guys. Find hoodies made from quality fabrics, as well as staple shorts and t-shirts, created with innovative designs to impress you and your pack. With headwear, tracksuits and sweats available - you can fill your whole wardrobe with 11 Degrees. Don’t wait to dive in, discover the New Products and you’ll be the envy and inspiration of all your peers when you become an 11 Degrees fan. How do I use my 11 Degrees discount code? Continue to check out securely. Join the mailing list to be the first to know about special offers and new arrivals from 11 Degrees. 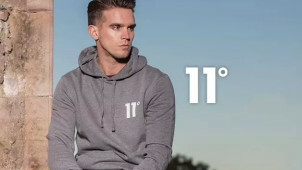 Are there 11 Degrees stockists? Yes, dotted around the UK, check out if there’s one near you. Can I purchase 11 Degrees gift vouchers? Indeed, simply enter your gift voucher details online to get it on its way to a lucky someone. When is the 11 Degrees sale? You can find clearance products online all-year round at 11 Degrees. 11 Degrees offers a 14-day returns policy, and will deduct £2.50 from your final refund. Returns can be made through ASDA toyou in over 600 stores. Email: admin@11degrees.co.uk use the live chat or fill in the form on the contact us page. For stylish menswear in cool shapes and fits, 11 Degrees have got you covered. 11 Degrees are committed to making sure the latest trends are on offer for their customers, so you can look the part at all times. Stay bang on trend for less by using an 11 Degrees discount code at vouchercloud. Whether you are looking for cool, casual wear or an outfit for a night on the town, score a wardrobe win at 11 Degrees. If you are in need of something in a hurry, you can order next day delivery at 11 Degrees. For £7.50, you can rest assured your new purchase will be with you by 4pm the next day, guaranteed. So, if you desperately need that new outfit for a night out, don’t panic- order by 9pm and it will be with you the next day! Shop the 'Holiday' collection at 11 Degrees and get everything you need for your well-earned break. Shop with an 11 Degrees voucher code and pack your case with some awesome new summer threads. From summer shorts to stylish swimwear, make sure you look the part on your travels. Protect yourself from the sun in one of the high-fashion hats on offer, or cool off poolside in a trendy vest.